Happy Monday! It’s the first Monday of October and thins veered toward autumnal mighty fast. Last Monday, it was 85 degrees here…this Monday in begging the landlord to turn the heat on because it was 55 inside all weekend (that’s 29.4 to 12.7 in one week, for the Celsius crowd). With the drop in temperature, the leaves are rapidly turning shades of orange and red, inspiring today’s polish pick. 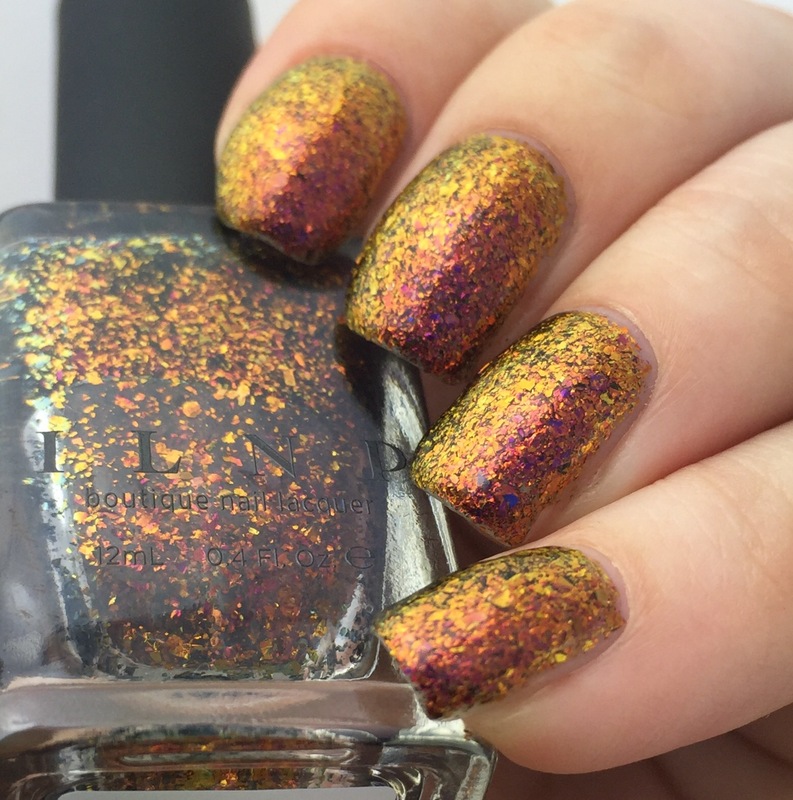 This is “Glory,” a multichrome flakie from the Fall 2015 collection from ILNP. The colors are incredible: it starts greenish at the edges and goes yellow, orange, and then pink, with the slightest hint of fuschia/purple in some lights. This is my first multichrome flakie and I love the look- it’s so multi-dimensional and it looks great in all light. The flakies are so unique and I feel a bit like I’m wearing an exotic gemstone on my nails. I also like that the flakies hide any possible imperfections or unevenness in my nails- pretty impressive for something metallic. On the other hand, (well other hand figuratively; literally it was both hands) I did not love the formula. 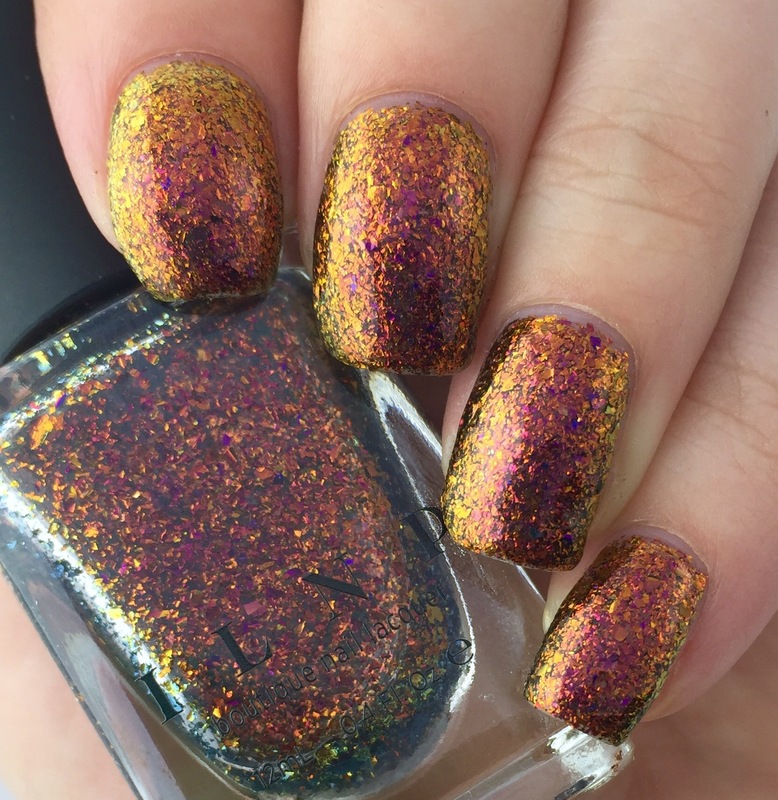 For me, this had a lot of the clear base for the amount of flakies, which made it difficult to wear on its own with a reasonable number of coats. This is 4.5 coats and I feel like it could still cover a bit better. But there’s so much base that 4.5 coats is too thick and goopy to consider adding anything more. I’m thinking it probably works much better as a sparse topper, but I’ve seen so many lovely photos of it on its own that I’m a bit disappointed. Perhaps it’ll be one to sponge on or to use in mix-and-match manis? Complaints aside, it is a good looking polish. I am normally a fan of ILNP, and this did wear pretty well, despite the absurd number of layers. I really like their regular selection of holos and multichromes, which I think I’ll stick to in the future. (And by “stick to” I mean “buy as many as I can afford during pre-sale.”) the Fall collection just went up for regular sale this weekend, so “Glory” and all of its comrades are now available for purchase. 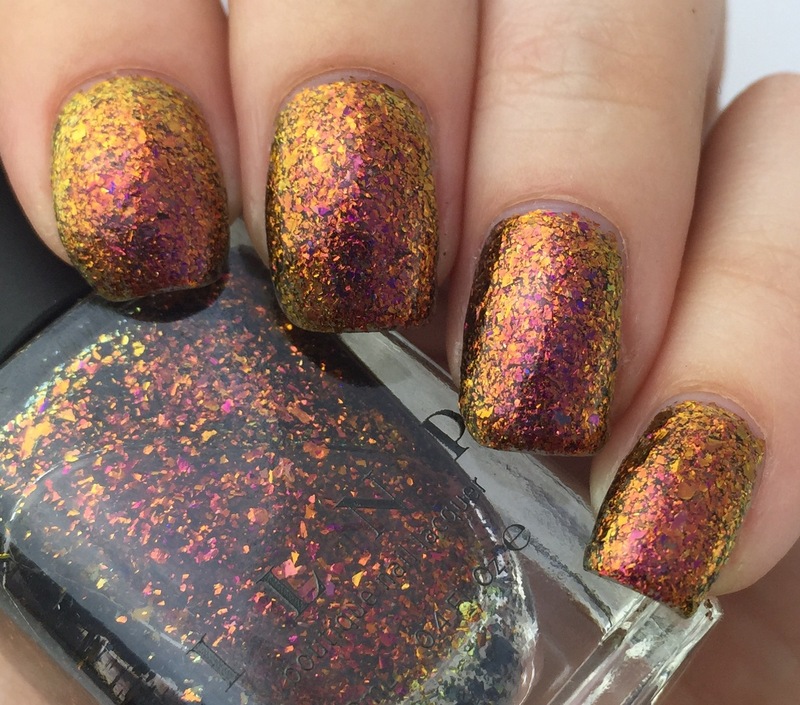 You can find “Glory” (and so so so many other amazing colors) on the ILNP website. This screams Autumn! Absolutely stunning! I wish it could have gotten to opacity in less coats though. I prefer wearing polishes on their own when I can, but when they take 4-5 coats, it’s just gets to be too much for me. I knowww…I’m so spoiled now that at 4 coats, I totally give up. I think the sponge method might help to cut down on the base, though, if I’m really committed to using this all the time. Thanks! I’m experimenting with a new lighting setup! this is a great swatch. Holy cow. The shift on this is lovely! For flakes like this, sponging them on can reduce the number of layers needed to get the foil look. there is a bit more cleanup though, even with a liquid barrier. I love flakes IN polish but have never been a fan of flakes AS the polish. That first photo had me like whoaaa such a beautiful shot! Aww thanks! I’ve got some matted photos coming up as part of next week’s nail art and they knocked my socks off. I just want to peer at my nails. I love this polish! Well, the whole collection really! I really want to love this but 4.5 coats is a big turnoff for me. I really hope it works better f you sponge it on because it’s one stunning polish. wow thats a ton of flakes! ← Plaid (Notre Dame) Gameday Nails!